Sometimes tinnitus is accompanied by hearing loss and vertigo , a sensation of spinning while standing still. Joining a support group . 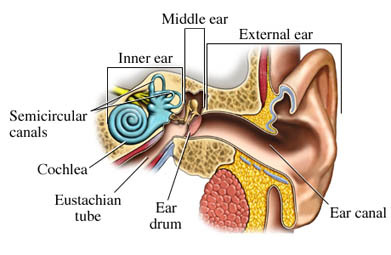 Acute otitis media (AOM). EBSCO DynaMed Plus website. Available at: https://www.dynamed.com/topics/dmp~AN~T116345/Acute-otitis-media-AOM . Updated May 16, 2017. Accessed September 27, 2017. Tinnitus. American Academy of Otolaryngology—Head and Neck Surgery website. Available at: http://www.entnet.org/?q=node/1324. Accessed September 27, 2017. Tinnitus. American Speech-Language-Hearing Association website. Available at: http://www.asha.org/public/hearing/Tinnitus. Accessed September 27, 2017.